MSM64 participants posing for a group picture. Photobomb by RV Maria S. Merian. 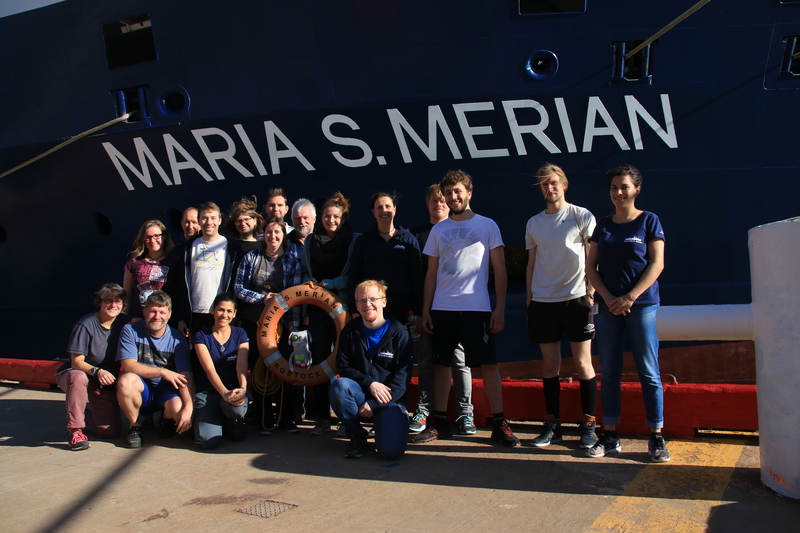 Cruise MSM-64 was carried out aboard the German research vessel (RV) Maria S. Merian, a multi-purpose vessel designed for interdisciplinary research in coastal seas, on continental shelves, and in the blue ocean. The cruise focused on assessing the strength and variation of the currents in the southern subpolar North Atlantic. Another aim was to investigate the variability in the formation and spreading of North Atlantic Deep Water and its components, one of the dominant water masses of the subpolar North Atlantic. For these purposes, ship-based measurements were carried out along 47°/48°N. Furthermore, long-term measurement arrays installed at the sea-bottom along this transect were recovered and redeployed again. Three participants of the cruise, Aleksei Buinyi and Hannah Nowitzki from the University of Bremen, and Yarisbel Garcia Quintana from the University of Alberta, Edmonton, Canada, are members of ArcTrain. The video below summarized their experience, unique and challenging. Enjoy!